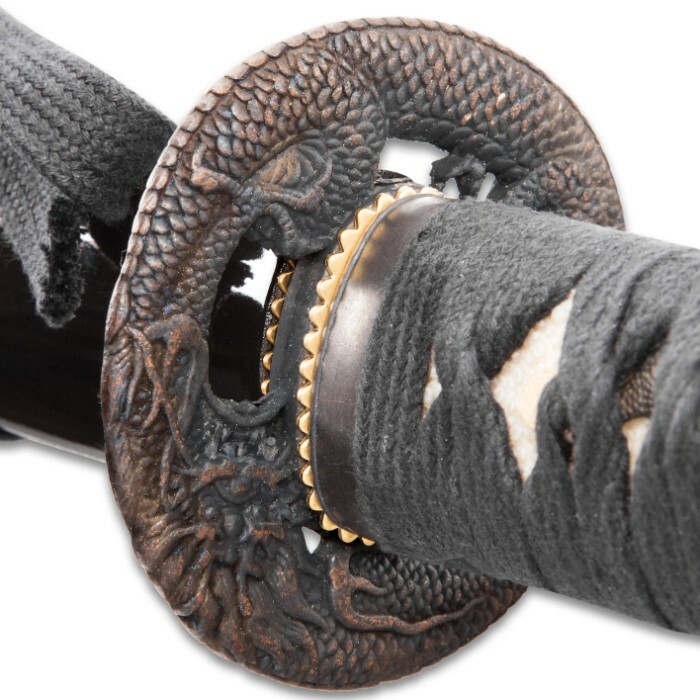 The Black Dragon Katana is a sword to be reckoned with, unleashing its power on whomever wields it. Sleek and smoothly the 28” carbon steel blade draws from the black lacquered wooden scabbard. 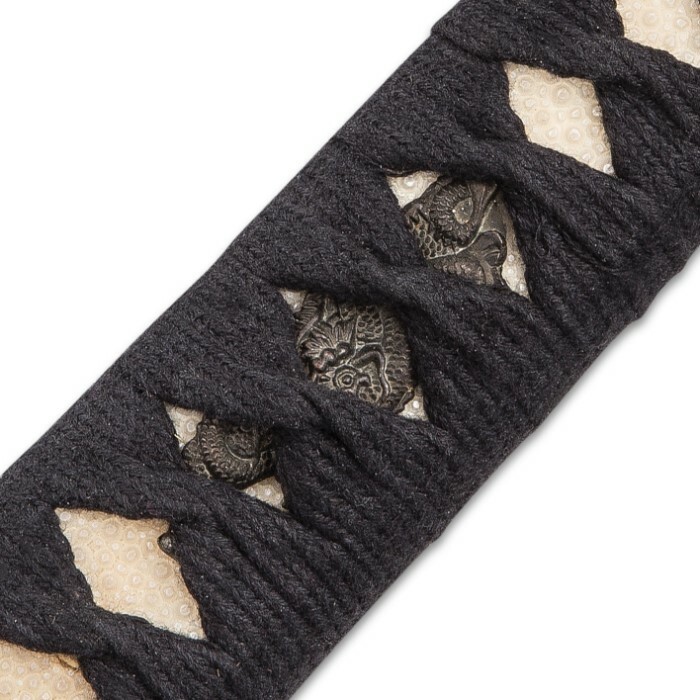 The metal cast tsuba is in the shape of a dragon and the wooden handle is wrapped in real ray skin with a traditional black cord wrap. 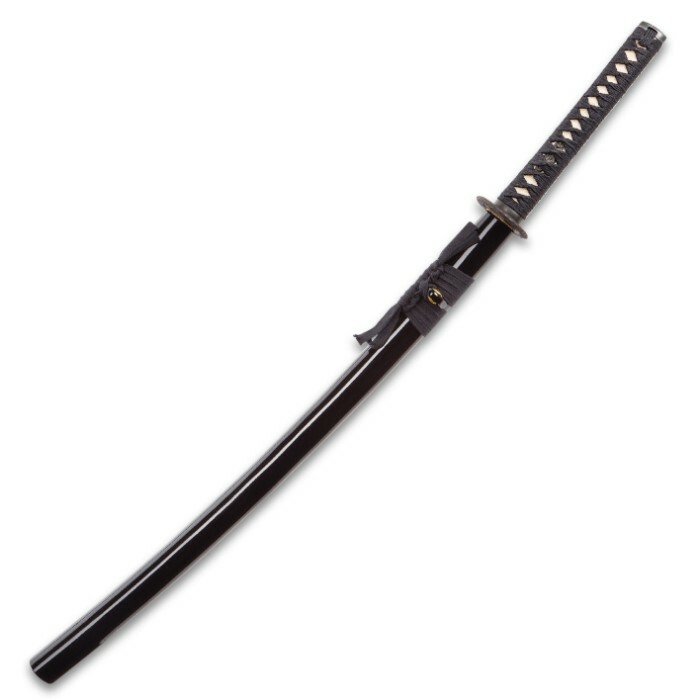 The katana is full-tang with an overall length of 40 3/4". 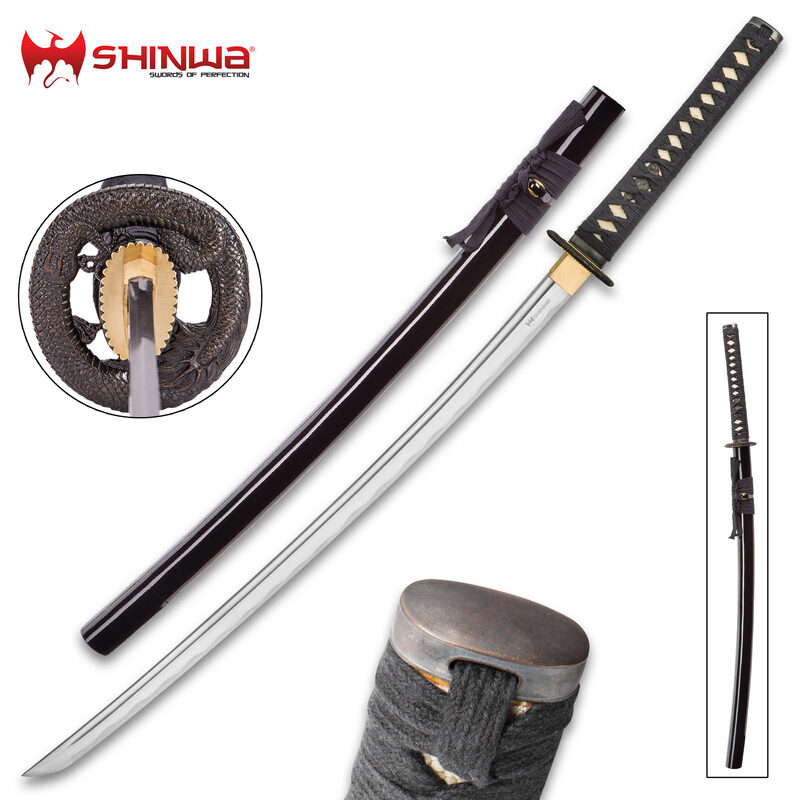 This is a great katana, especially for the price. The craftmanship is great and the detail is very fine. It arrived very sharp too. Very nice sword. Great piece to start my katana collection. it is super sharp! Perfect Katana thanks BudK!!! Came super sharp, clean, no damage. Cant ask for a better sword. I just got mine delivered today. The tape around the primary box was in need of some assistance ~ but overall it got here in good condition. It was like Christmas in July. This Katana is just plain awesome. The scabbard or holder for the katana is beautiful. This katana comes very sharp and well oiled ~ it is heavy but not too heavy. 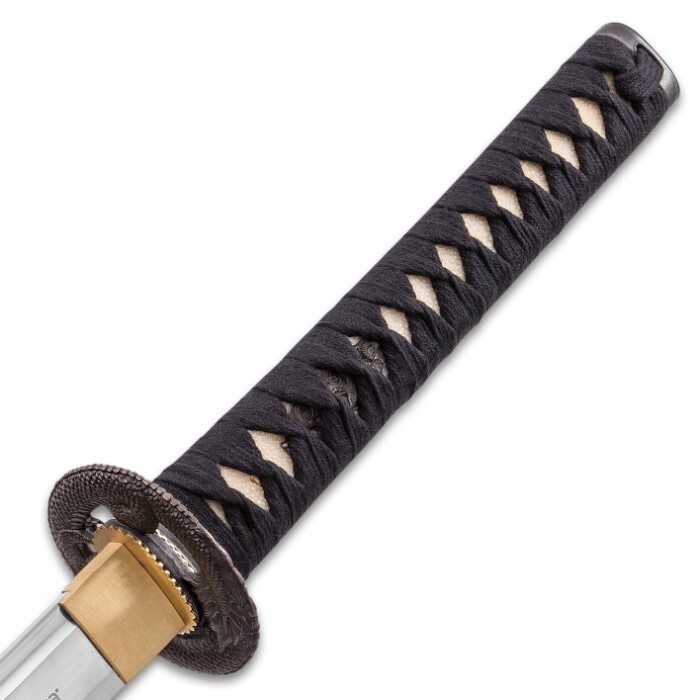 It comes in a cloth sock-like protective cover that covers the entire katana and can be tied off with the attached tie. I tell you what ~ this is an awesome blade ~ that's all I've got to say. I am very happy with this purchase. This sword came in looking and feeling better than any other. The edge is too sharp to touch in my opinion. The only complaint is that the blade came with more metal than needed in the form of bubbles, after a few adjustments though it was good as new. I can say this will preform to the standard of cutting rugs into pieces, but as far as cutting lots of paper and wood, I just wouldn't because the blade is meant for cutting flesh not wood, tin cans, plastic bottles, or anything else for that matter. So if you're going to buy this just for cutting things, also look into a wet stone sharpening kit. If you want to cut up trees, get an axe or machete like the paper that comes with this sword tells you. Last thing is that I'm happy with this product and so is my son who gets to have it. For $60 you can't go wrong. I picked this up for $60, and couldn't be happier. The blade is sharp and polished nicely. The blade was well oiled when it arrived. It did have a small scratch on the end of the scabbard, but I think that was the shipper's fault. It's a beautiful sword.